The Environmental Protection Agency unveiled the Natural Gas STAR Methane Challenge Program at this week's Global Methane Forum held in Washington. Methane is a potent greenhouse gas, capable of trapping 25 times more heat in the atmosphere than an equivalent amount of carbon dioxide. EPA Administrator Gina McCarthy said the voluntary program is meant to protect public health and combat climate change while providing a platform for companies to report actions taken to reduce methane emissions. 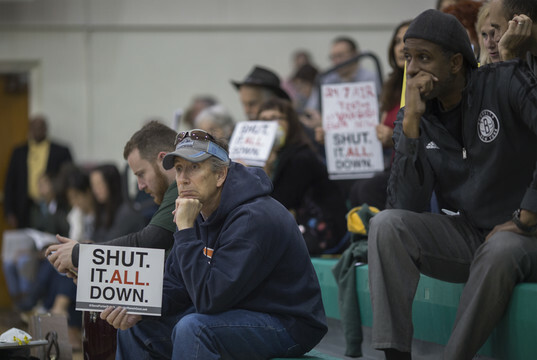 The announcement comes after the worst methane leak in the nation's history was finally plugged last month at an underground storage facility owned by Southern California Gas Co. The months-long disaster required the evacuation of 6,400 families and released the climate-warming equivalent of the annual pollution from more than a half million cars. While the massive California leak focused public attention of the issue, much smaller and more mundane leaks from natural gas operations in the United States have an even larger cumulative impact as a man-made cause of warming the planet. SoCal Gas is among those who've signed onto the voluntary emissions reduction program, along with major gas pipeline and distribution providers Duke Energy, Exelon, TransCanada, Xcel Energy and MidAmerican Energy Co.
President Barack Obama and Canadian Prime Minister Justin Trudeau committed earlier this month to reducing methane emissions from the oil and gas sectors by at least 40 percent over the next decade, compared to 2012 levels. Such reductions are seen as essential to achieving national targets for greenhouse gas reductions agreed to in December as part of the landmark climate accord reached in Paris. Republicans in Congress have opposed such measures, saying they will cost the U.S. economy jobs while doing little to reduce climate change.